Japan Letsgo: Wisconsin Cheese in Tokyo: "MJ Toastie the Profound"
Wisconsin Cheese in Tokyo: "MJ Toastie the Profound"
Aeon (イオン), a giant super market chain in Japan, now carries Crystal Farms Cheese from Lake Mills, Wisconsin, my hometown. 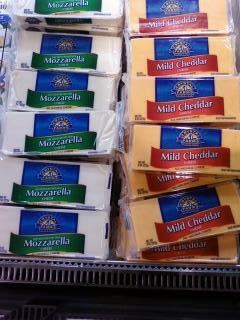 I happened to drop by again today to re-stock my fridge after taking two blocks of Cheddar to work this week. 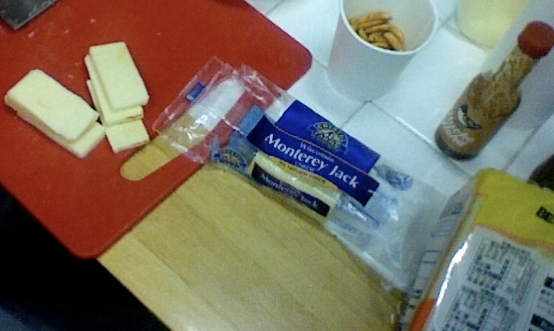 I prepared two cheese platters for my co-workers. Neither made it to the lunch break and everyone was asking, "Where can I get some of that cheese?" Needless to say, my plan to boast Wisconsin Pride is a tremendous success. If I wore cheaper suits, I am sure I would have busted a button or two. 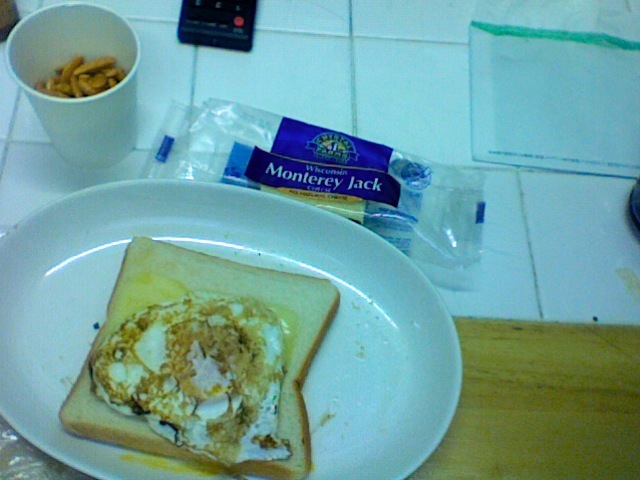 This week's culinary tribute to bachelor living: "MJ Toastie the Profound." Similar to last weeks "TK Cheddar Dog", the MJ Toastie's most important ingredient is Crystal Farms Cheese. And in keeping with its namesake, is actually quite profound. I dare say this is the best bachelor's food this side of the Pacific. I used Crystal Farms Monterey Jack this time. I had my buddy Caesar slice it up, place the slices on bread, and throw it all in the toaster oven. 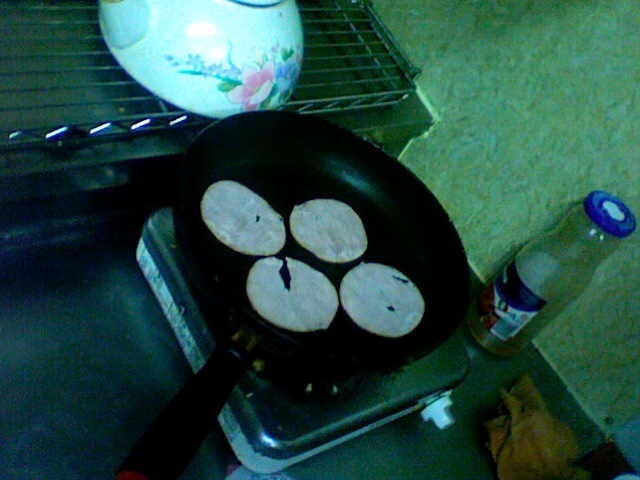 Next, I grilled up some ham slices. I also threw on some fried eggs. 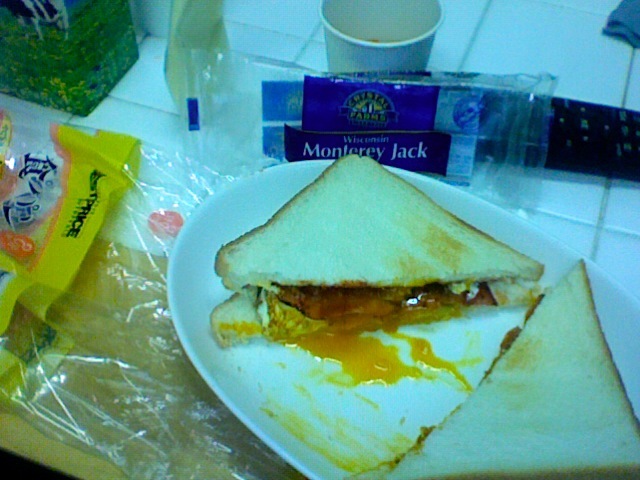 Finally, top it off with some Mucho Aloha sauce and behold: MJ Toastie the Profound. Caesar and I discovered this key equation when preparing anything with fried eggs: the runniness of the egg is proportional to its tastiness but is inversely proportional to its ease of edibility. In other words, the tastier, runnier egg is a complete mess to eat! Enjoy! 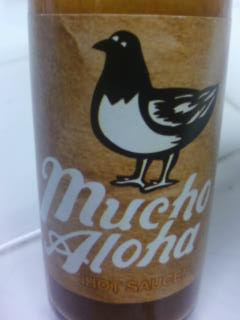 Mucho Aloha! Much Love!